Have lots of fun in the concert! LOOOOOVE this look on you! Dang, girl - where have you been? Love this 80 fabaliciousness! Rita, you look AMAZING. Missing you around here, lady! Oh, how fun! Love the outfit, and your hair looks stunning! Oh my, you rock the leather pants. Great outfit. Sounds like you had fun too. You look perfect! I still love that vest and am so glad you went back for it! Holy @#$#$#, you look amazing, girl! You have the funnest life, bouncing from Birthday Bowie Ball to Blondie! 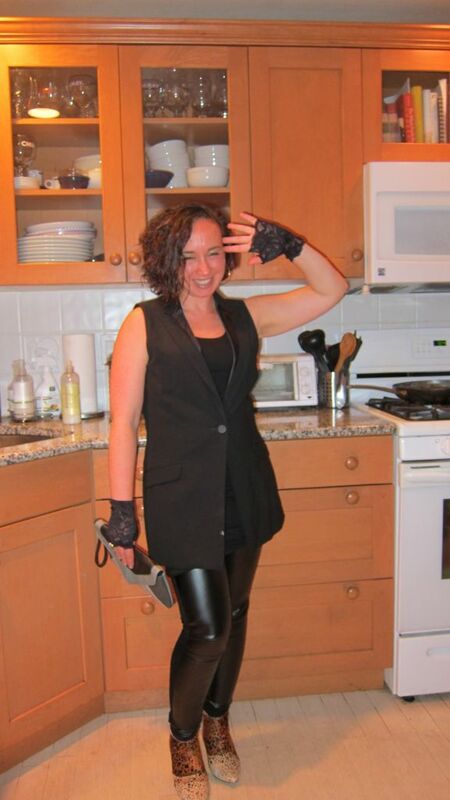 Academic by day, rocker chick par excellence at night. Those 80's and futuristic details work so cohesively together. Fab outfit for a fab event! No wonder you had fun! Hi Everyone! Yes I came out of hiding. Work and Life with two small children have been super busy lately and I don't have much YLF time. Also, my outfits haven't been super creative or cutting edge as I only have time to throw on my FFBO's... I don't feel like there's much new to share... Less time on the forum means I'm not really moving my wardrobe forward right now. The only shopping I've been doing is replacing worn out tried and true favorites and filling immediate gaps (like a cocktail dress for my cousin's wedding). Mochi, Jeanne and Diana, do you remember when I found this vest in the first 30 seconds I was in NY? I had to agonize over it for the appropriate amount of time. I'm glad I went back for it a few hours later. My 80's ensemble would not have been complete without it! Glad you had a great time, you really do look FAB! Love the addition of the gloves. The '80's was a great decade! Rock on, sista! Waaa! How awesome looking are you!!! And Blondie and X, wow! I'm totally jealous. I've seen X and I've seen the Knitters. Yes, I'm that kind of fan. And don't even get me started on how cool it is that Exene is just one degree of separation (Viggo!) from the Pope! The Pope! And Exene! Sorry. Ran away with that one. Woooo. But I've never seen Debbie Harry, so I am very jealous! Especially since you got to see them at the same time. So jealous. Awesome. I'm glad you had fun. She still sounds great and how about X? Wow. So modern, so sassy, so retro (in a way) I love it! Marking as a fave! Saw this earlier in the week and loved it! Glad you had a blast; DHarry is definitely a tough broad with talent. This is both fun and chic. Blondie... X... taking me back! This is simply awesome, Rita.